The unconventional love story of an aspiring actress, her determined driver, and their boss, an eccentric billionaire named Howard Hughes. ‘Rules Don’t Apply’ has to be the oddest film I’ve seen this year, a bizarre movie that switches between a variety of genres across its two hour runtime. On one hand an unconventional biopic of Howard Hughes, on another a romantic comedy about two people falling in love against the backdrop of Hollywood, it’s certainly never boring, but it’s not particularly good either. 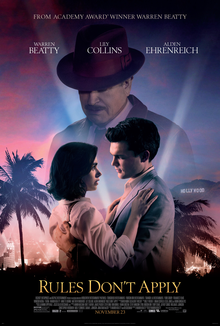 The film’s plot loosely follows a budding romantic relationship between a young actress (Lily Collins) and her chauffeur (Alden Ehrenreich), both of whom work for ageing aviation innovator Howard Hughes (Warren Beatty). Set in 1964, the film explores social standards and expectations of the time, whilst also working as an exploration of an elderly, eccentric billionaire and his various quirks. The film is tonally all over the place and occasionally plays scenes for laughs that really shouldn’t be played for laughs, but there are fitfully amusing segments scattered throughout. Despite being far too old to play Hughes at this stage of his life (which perhaps explains why much of his scenes are shot in the dark), Warren Beatty shows some of the old charm that made him one of the leading movie actors of his time, although his story doesn’t make a whole lot of sense. The performances of the young leads (Lily Collins and Alden Ehrenreich) are both really good and well played and they made their characters and their potential love worth rooting for, and I wish the film had focused more on their characters. The rest of the cast is filled out with a large amount of well known faces in the supporting role, although none feature long enough or fit into the overarching story to merit more than a passing comment. Warren Beatty’s status as a Hollywood legend is probably the only reason this sprawling, all over the place movie managed to get made and it’s certainly one of the more interesting efforts you’ll see this year. Interesting doesn’t always mean good though and ‘Rules Don’t Apply’ is too much of a mess to truly recommend.